Castor oil is a well-known laxative, which cleans the intestines and results in better digestion. It is known that the plant in a whole state is toxic, although in the form of cold-pressed oil it is completely safe to use. Castor oil has found its use in cosmetics and the beauty industry, as an ingredient in the skin care products, hair and nails products. What makes castor oil healing? 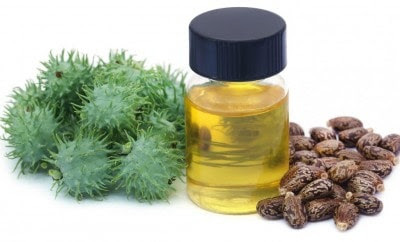 Castor oil is used for rapid growth of hair, nails, eyelashes, as well as for the care of facial and body skin. To achieve this effect, ricinolone acid, has many medicinal properties - antibacterial, antifungal, and antioxidant, anti-inflammatory. This acid in oil enhances circulation, removes free radicals, and affects the synthesis of materials necessary for rapid growth of hair, nails, and eyelashes. How to make natural preparation from castor oil for skin care? First, prepare some extra strong tea from the chamomile and strain it (less water, more dry parts of the plant) and add 2 tablespoons of castor oil to the chilled tea. You can lubricate the mixture of tea and oil of castor on places with sun burns, or in the presence of dry skin. You can also put in a spray bottle, and then spray after sunbathing. Mix oils and add 5 drops of eo tea tree oil and put in a dark spray bottle. Apply directly to acne after cleansing the face or on the skin of the head where there is dandruff, before washing the hair. Apply directly to critical sites and rub. Combine the ingredients and leave the mass to tight in a solid balsam. Rub the skin around the nails. Smooth the ingredients and apply on the face and do it peeling of face with circular movements. After that, wash your face and apply the face cream.